Halifax coach Richard Marshall has said he is likely to resist any temptation to ‘make wholesale changes’ ahead of Sunday’s Championship fixture at Workington (3.0). Fax head up the M6 on the back of their 26-6 loss at Sheffield, a game which saw them carve out - and squander - chance after chance before being hit with a four-scores-10-minutes sucker punch early in the second half. And while Marshall did not rule out some alterations to his selection, he hinted they would be limited. “We’ve got some players who are probably under a bit of pressure and we’ve got players outside last week’s 17 who are pushing for places,” said Marshall. “We’re not sure of the make up of the team yet, but there won’t be wholesale changes. “We’ve reviewed the Sheffield game in detail and looked at the things we did to create seven, eight, nine first half chances, but also the things that contributed to us not taking those chances. “I think we need to improve the way we position our support players at times and our communication needs to be better, so people know what’s going on. “The biggest area of concern was our defence in that 10 or 15 minute spell after half time and again we’ve looked at getting more players into contact this weekend. “Workington are a lively side, and they’ve got some dangerous players, but I’d be disappointed if this team wasn’t capable of going up there and performing well. “They’ll have targeted this game after two losses and they’ll challenge us. 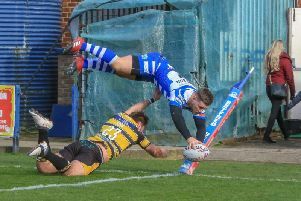 Marshall has been buoyed by the return of full back Miles Greenwood to full fitness, with the player due to make his first appearance since breaking his leg in two places a year ago in Thursday night’s postponed reserve game at Dewsbury, a game that was subsequently rescheduled for Monday (7.30). Greenwood is joined in the side by winger Tommy Saxton, half back Connor Robinson and forward Andy Bracek. “It’s great to have Miles back, he’s been out for a year more or less and that’s a long time to be away,” said Marshall.